Ever since purchasing my first Mac, which had Tiger installed, I've been interested in the potential of Automator. Unfortunately, time and opportunities have both been lacking and I've been unable to spend much time with the application. But that's one of the nice things about having your own blogthings that once were categorized as 'play' can now be categorized as 'work' or 'research'. And since getting serious about my site and posting regularly, there have been a couple of workflows that I thought could possibly benefit from some automation. This is a sequence that was screaming to be shortened or simplified. So I thought it was a good opportunity to get more familiar with Automator. Hopefully I could improve my workflow and save some time. This workflow makes use of a Flickr feature that allows users to post images via email. A small warning herethis is for use only with small numbers of images. The Flickr help page states that the post via email method supports neither large numbers of images nor very large images. This is not an issue for me as I usually have two or three small images at once to upload. And so far the usage has been fine. After taking the needed screen shots, I ensure they are all selected on the desktop. Then a simple right click and I choose the following option from the menu: More -> Automator -> [Workflow Name]. After a few seconds, the plugin kicks in and a new mail message is generated, filled out with values I have specified within the workflow. The images are added as attachments, the message is sent and then the images are moved from my desktop to the Trash. 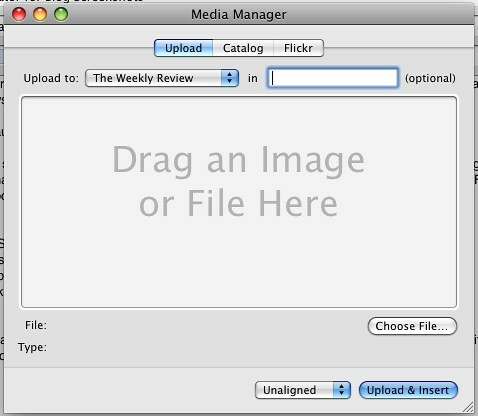 Now I can return to MarsEdit and use the Media Manager to grab the files from Flickr and insert to my blog post. Pretty easy. There are a couple of settings that need to be updated to use this workflow. First, you have to enable your Flickr account to be able to post images via email. This can be done under your account settings on Flickr iteslf. The one negative of this setup comes from using the upload via email. Currently this function does not allow you to specify a set or collection to add the photos to. I hope Flickr adds this in the future. The positive changes are that the images are stored on Flickr and not my blogs upload folder and that my workflow is much faster and more efficient. The number of steps is the same, but the new steps are much shorter. No more updating files in multiple locations. Whatever the reason, I found that it took a lot of playing around with the actions to get them in just the right sequence so the whole workflow ran correctly. There were a lot of test versions that resulted in duplicate images. Others never moved the desktop items to the trash before completion. In the end, it seems the workflows perform the best when each action passes values on to the next, as this one does. At the very least, I feel more comfortable with Automator now. I'm looking for the next opportunity to automate a repetitive task.